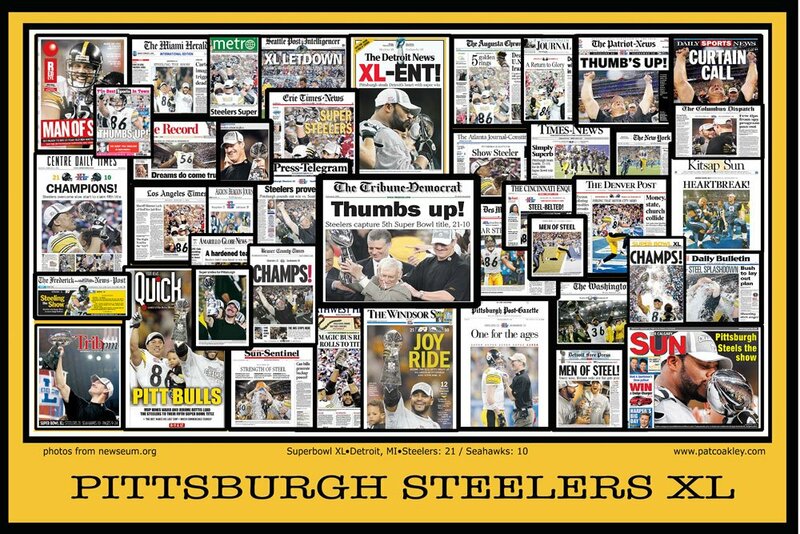 I had not received a single email about my Steelers column as of the other day which seemed puzzling to me. I was just certain that this one was really good and would have struck a chord with ex Pittsburghers if no one else. I inquired and was told that there was a problem with my email box and they were working on it. Well, yesterday they solved it and I received a dump of messages.. dozens of them, most of them really touching, many from ex Burghers living all over the globe, including a Ligonier native in South Africa. There were also a couple from old friends who found me… one a friend of Eric R’s, and one from Tom Smuts, a friend from Reizenstein Middle School. It is so cool. In many ways, I fel this column is the thing I have been waiting years to write.. finally to express some of my love for Pittsburgh. I’m not sure what comes next, but I am working on it. I’ll post a sampling of the letters, beginning with one from the artist wh made the above collage. I replied and sent has sent me a poster, apparently creating quite a stir in her small town Mass. post office, with empoyees looking up PEE-KING. She is selling them on EBay. if anyone wants info on getting one, let me know. Greetings from Massachusetts, home of the almost dynastic Patriots. will be a 13X19 print. There are about 41 newspapers included. Does anyone know this guy, who grew up around the corner from us? Loved every word of the Steelers article. I believe you capture the spirit and feelings of all of us who ,for various reasons , have left Pittsburgh (in my case Northumberland Street in Squirrel Hill.) 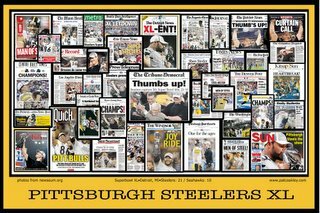 I too grew up in Pittsburgh during the 1970’s and recently tried to explain to my officemates why the Steelers embody the soul of Pittsburgh and that they are somehow a part of those of us who grew up there. Thank you for a great article. You are what a Steeler Fan is ALL about!! !